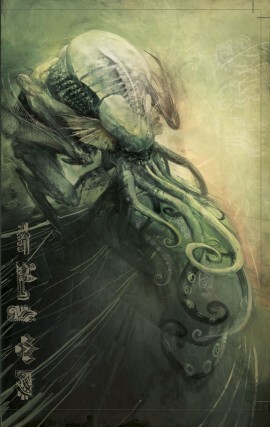 If you have never read The Call of Cthulu, you should. Not only because it is a literary classic like many of his works, but to understand the subculture that grows internationally in Lovecraft’s wake. What makes Eldritch Abominations like The Old Ones so incomprehensible? We can wrap our heads around paradoxes, quantum mechanics, theoretical physics and way more. The moment we stare or sometimes even think about these creatures we go batshit crazy or die. What is so mind shattering about a big ugly squid? “Big ugly squid.” I wish I was still that innocent, still unaware of what…they really are. Once you know, once you really understand – or if you are among those damned to witness it yourself – once you know, you will never forget. It keeps me up at night, and if not for my physician’s pity I would never sleep at all. Squids. It’s charming, frankly – the Old Gods, with bloated and frowning faces writhing with tentacles like the beard of Neptune. Like a God of Egypt, with a man’s body and an animal’s head. A curiosity, and little more. The truth…well, I cannot tell you the truth, not properly, as a man of science should. These things are beyond our science. Still, I understand things about them that explain some of the reports, and perhaps you can carry on my research now that I can no longer pursue it. It comes down to dimensions. We possess three – height, width, and depth. Grip a billiard ball, feel your fingers wrap around it, and you will understand. Now imagine a creature that existed in only two of those three dimensions, in a universe that described a simple plane through our own. To that creature, the billiard ball would appear to be a simple circle, growing and shrinking as it passes through the plane of the creature’s universe. Imagine how our hand would look – strange fleshy circles filled with pulsing fluids, shards of bone, glistening meat. The creature could never understand what it was really seeing, as it could no more conceive of a hand than it could imagine a creature like us, moving freely in three dimensions and gripping billiard balls on a whim. The Abominations, as you aptly described them, are to us as we are to that benighted creature. They exist in dimensions beyond our own, whose nature we can hardly guess. When they appear to us, we see only fragments of their bodies – long stretches of writhing flesh, glistening with juices that should not exist outside of a body, which whip through the air and vanish back where they came from in a way that our minds simply refuse to accept. Witnesses have tried to describe these as great tentacles, words failing them in the presence of such incomprehensibility. Those who heard the stories seized on this, and explained them as resembling cephalopods. This is a comforting lie, as there is nothing in the most stygian depths of the darkest sea that is not our beloved brother compared to the horrors of the Abominations. This is a creature who is incomprehensibly alien, and our only glimpse is a sickening flash of writhing, elongated flesh that slips into our world and back out. Worse than the appearance of the creature, though, is its disappearance – your mind knows, on some level, that this creature – this hateful, hungry god of a creature – is not moving it’s body between “here” and “away”, but between being a glimpse of a writhing horror, and a horror that watches unseen. Imagine our two-dimensional creature again, and imagine yourself to be a cruel child. If you chose to torment the creature, it would be powerless to resist. It cannot perceive you unless you chose to intersect its plane – you can watch its every move, and it cannot hope to escape your gaze. It would be the simplest thing in the world to push a pin through it, like a butterfly on a card. Take a glass of water and push it into the creature’s plane and it will find itself trapped, drowning, in an inescapable sea. The creature is entirely at your mercy, and always will be.